Bonn: The West used an Afghanistan meeting on Monday to signal enduring support for Kabul as allied troops go home, but economic downturn in Europe and crises with Pakistan and Iran could stir doubts about Western resolve. “The United States intends to stay the course with our friends in Afghanistan," US secretary of state Hillary Clinton told the conference. “We will be there with you as you make the hard decisions that are necessary for your future." Hosts Germany sought to signal Western staying power as the gathering of dozens of foreign ministers opened in the German city of Bonn. “We send a clear message to the people of Afghanistan: We will not leave you on your own. We will not leave you in the lurch," said German foreign minister Guido Westerwelle. Ten years after a similar conference held to rebuild Afghanistan following the 11 September attacks, Western countries are under pressure to spend money reviving flagging economies at home rather than propping up a government in Kabul widely criticized for being corrupt and ineffective. Pakistan boycotted the meeting after a North Atlantic Treaty Organization (Nato) aircraft killed 24 of its soldiers on the border with Afghanistan in a 26 November attack the alliance called a “tragic" accident. But foreign governments, while regretting Pakistan’s absence, made clear they would press ahead in building up the Kabul government’s ability to survive after 2014 even if Islamabad fails to bring insurgents into a political settlement. Embryonic contacts with the Taliban have so far yielded little, and with the government in Kabul unable to provide security and economic development, the risk is that the withdrawal of foreign troops will plunge Afghanistan back into civil war. Renewed strife might also stir more violence over the border in Pakistan, fighting its own Islamist insurgency. Iran’s growing confrontation with the West over its nuclear programme could also bleed into the war in Afghanistan. Foreign governments however were determined to try to dispel at least some of the pessimism seeping into the Afghan project. Indian foreign minister S.M. Krishna pledged India would keep up its heavy investment in a country whose mineral wealth and trade routes made it “a land of opportunity". In a rare positive development, Clinton said the US would resume paying into a World Bank-administered trust fund for Afghanistan, a decision that US officials said would allow for the disbursement of roughly $650-700 million in suspended US aid. The US and other big donors stopped paying into the Afghan Reconstruction Trust Fund in June, when the International Monetary Fund suspended its programme with Afghanistan because of concerns about Afghanistan’s troubled Kabul Bank. German Chancellor Angela Merkel told the conference that reconciliation remained an important part of efforts to stabilize Afghanistan. “The political process will have great importance in future, this is the place where the questions of reconciliation and power sharing must be solved in a way that includes all parts and ethnic groups of the society," she said. Britain’s Hague reiterated that any settlement with insurgents would require them to renounce violence, sever ties with Al Qaeda and respect the Afghan constitution—“end conditions" which some argue effectively close the door to talks by determining the outcome in advance. 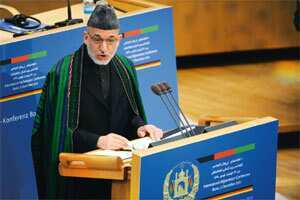 Afghanistan has blamed Pakistan for hindering peace talks. Pakistan says it is being used as a scapegoat for the failure of the US and its allies to bring Afghan stability.